Jeff Blood has fly fished around the world for fresh and saltwater fish for over 40 years. 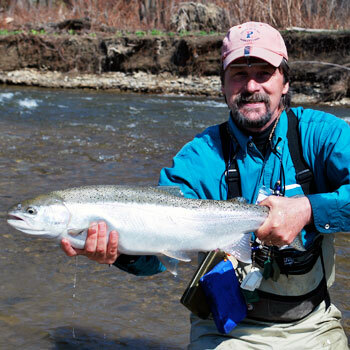 He focuses on Great Lakes Steelhead, mostly in the tributaries of Lake Erie, near where he grew up. Aside from owning a sales and marketing company designing promotions and incentive programs for corporate America, Jeff was a part owner of a local fly shop for about 10 years in Pittsburgh, PA.
Jeff Blood a lifelong fly fisher talks about what it takes to design and build a commercial fly rod. He'll dispell the myths and sweep away the smoke and mirrors of advertising to get down to what really makes a fly rod great. He developed Frog Hair tippet and leader material in conjunction with Gamma Technologies during the late 1990s and early 2000 that has given him insights into the methods for research and technology development as applied to consumer product manufacturing in the fishing industry.